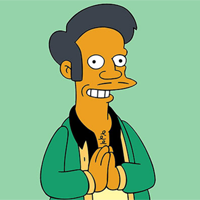 The Simpsons' acknowledgement of the Apu controversy on Sunday's episode came nearly five months after Hari Kondabolu's The Problem with Apu documentary made headlines by delving into the hit cartoon's Indian-American stereotype. "On Sunday night, The Simpsons, a cultural staple and television’s longest-running sitcom, now in its 29th season, finally responded: with a dismissive nod that earned the show more criticism, especially from Mr. Kondabolu himself," writes Sopan Deb, adding: "The writers of the episode — one of whom was Matt Groening, the show’s creator — received immediate backlash. Some viewers found the response tone deaf, and criticized the choice of Lisa, often the show’s moral center, to voice it." For his part, Kondabolu sent out a series of tweets last night saying "The Simpsons response tonight is not a jab at me, but at what many of us consider progress." This morning, he added: "TO THE JOURNALISTS WHO HAVE ASKED ME FOR A PUBLIC STATEMENT ABOUT LAST NIGHT’S SIMPSONS EPISODE, I JUST WANT SAY: 'Congratulations to the Simpsons for being talked about & being seen as relevant again.'" 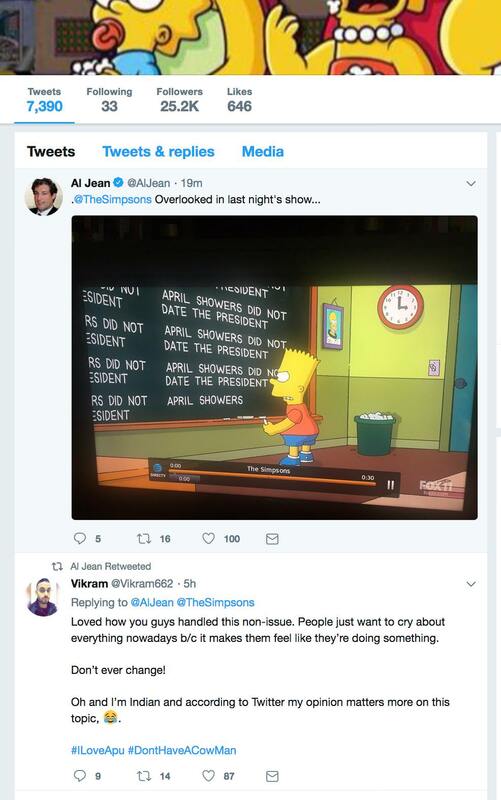 Asked to comment, Showrunner Al Jean said: "No the episode speaks for itself"
Jean also retweeted a Twitter user who tweeted "I'm Indian" and "Loved how you guys handled this non-issue"